My brother’s bachelor party in fabulous Las Vegas is this April, and I’ve put together an overview of casino game strategies, key statistics, and odds for blackjack, roulette, craps, and Texas Holdem for our crew. Jarod asked me to share this with all of you so that you’re also armed with the most-important information and tips for gambling in Vegas or at your local casino. Click the buttons below to get the printable PDFs … completely free of charge for everyone! Also feel free to review the starting-hands charts per game that we’ve provided for you free of charge as well as the poker-strategy articles and blogs. We want to see your profits constantly soar, and we’re here to support you on your path up the limits! PS: The following is a compilation of general strategic points to consider before hitting the Texas Holdem poker tables. 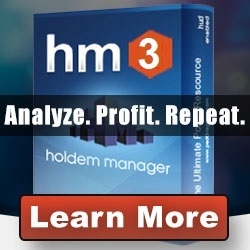 Adhere to strict bankroll management. Playing a big-stack strategy (BSS) in a NL100 cash game, where you buy in for 100 big blinds (BBs) or $100, you’ll need around $2,500 in your bankroll to handle the longer-term swings. You can buy in for 40 BBs and play a “hybrid” mid-stack strategy (MSS) at the same level with €1,000 in your bankroll, but not much less. With a small-stack strategy (SSS), i.e., buying in for 20 BBs per table and leaving the table once your stack is over 25 BBs, you could play at NL100 with a total bankroll of only €500. Play full-ring tables initially with a standard TAG (tight-aggressive) style. In general, you don’t want to play more than approximately 15% of all hands and should always focus on strong in-position play. Definitely change up your game from time to time if you’re facing decent “regulars,” but at the low/middle stakes (anything under NL200), it’s best to just sell it when you’ve got it! Once you have some success with this style, we’ll introduce you to the LAG style, which is especially important for optimal 6-max and shorter-handed play. Table selection is everything. Actively hunt for loose/passive tables and avoid tight/aggressive tables. The amount of players who see the flop is the primary indicator, which tells you how “loose” or “tight” the table is in general. Always be mindful of how looseness and passivity change at your table(s) during any given session. If players start to tighten up and get more aggressive or if the fish-to-shark ratio decreases, get up and find a better table. Also look for a better table if you notice that players to your left are consistently out-playing you post-flop (e.g., where you raise or call preflop, get reraised, and then end up folding quite a bit on post-flop streets. Playing “in position” is crucial for your long-term win-rate. If you’re able to choose your seat, as Mike Caro — the godfather of the science of detecting and reading poker tells — advises, “sit behind [i.e., to the left of] the money, have loose/aggressive players to your right and tight/passive players to your left.” Play fewer hands in early and middle position pre-flop (especially at full-ring poker tables) without “high-end” hands: e.g., in Texas Holdem, the top 3.3% of all hands are JJ+ or AQs or AK and the ~top 6.5% would be 88+, ATs+, AQo+. Really focus on getting involved in more pots when you’re in late position, occasionally raising also with speculative hands to “steal the button” and/or isolate limpers. As often as possible, you want to be the last to act on all post-flop streets. In order to reduce your VP$IP in early and middle position, a good rule-of-thumb from middle position is only to play your non-ace broadway hands (JT to KT, QT, QJ, and KT to KQ) as well as ATs+ when they are suited … not because suited hands are much better (they only add 3% to 4% equity to your hand on average) but because you’re 75% more like to be off-suited than suited. Using the typical “short-stack ranges” even when you’re big stacked is general advisable for most players at the full-ring tables. Your open-raise sizes in this case should be 4 BBS from early and middle position and 3-3.5 BBs in late position. If you’re on passive tables, where your opponents rarely raise limpers or rarely reraise (3bet) open raisers, there is no shame in limping or only flat/cold-calling with speculative hands listed in the following point in order to see what flops. If you hit big (i.e., 2 pair or better using both of your hole cards or a monster draw with 12 outs or more), you play on … and if not, you wait for a better wave. Be very cautious and generally play for pot-control (as opposed to pot building) when you “only” flop top pair or an over pair … especially on “wet boards” (e.g., 2- or 3-suited and closely connected in rank) with multiple players still involved in the hand. “Set mining”—calling with small/mid pocket pairs and playing on when you hit a three-of-a-kind or better on the flop—is one of your most-lucrative friends, especially vs. aggressive players. Just make sure that the effective stack size is at least 7.5 times the amount you have to call. For most players, I would generally advise over-limping with small/medium pairs (22-99), suited no-gap or 1-gap connectors and suited Ax hands or over-calling an open raise only if there have been multiple cold-callers before your action. When over-cold calling, most players should usually play “fit or fold” on the flop (with top pair+ or big draws) and usually bet if it is checked around to them when they’re in position, irrespective of what they flop. Always be mindful of your opponents’ flop check/raise stat. Especially when you flop a decent draw, it’s often a good idea to semi-bluff bet or raise when last to act and then take the free card if it’s check to you on the turn and you haven’t completed. Again, be very careful if you only have top pair in limped pots or where the preflop open raiser was in early position: you’ll often be facing 2-pair or better or an over-pair if you encounter serious resistance. When you bet, raise, or call preflop or post-flop, always wait the same amount of time before making the move, and almost always bet/raise the same amount … with AA and also with 54s! Adhere to a “stop-loss” every time you play. Any time, in any session, that you lose 3 stacks or more … pull the plug immediately! That means, see the rest of the hands that you’ve paid for with your blind posts for that orbit, leave the table, and take a break for a while. Maybe review the strategy section of this site a bit or the free downloads provided for members, or just relax and then start another new session later in the day. This “loss-limit” will save you hundreds (if not thousands) in the long run. Please note that the hand/position-specific recommendations above are very generalized for your cash-game play at Texas Hold ’em full-ring tables. You’ll find all the details for Omaha, 7-stud and 5-card draw/stud cash games and tournaments in the poker-strategy section and especially in the upcoming “Essential Poker Knowledge” videos.